The Liturgy of the Word today suggests: Yes, the Messiah is here! The Lord has visited his people! But it is also that the Lord invites us to a personal encounter with him and to a spontaneous attraction towards him. In the first reading we have the Prophet who is a chosen servant of God reflecting on his mission. Nothing could break his trust and confidence in God. He knows that God is coming. Then the eyes of the blind will be opened and ears of the deaf will be unsealed. In the second reading we hear that faith without work is dead. Living faith will perform works of charity. James tells us that God has chosen the poor of the world to inherit the Kingdom. In the Gospel, really to hear the Word of God is to carry it out. The word hearing implies, listening, understanding, making the message one's own and living it out in word and action. 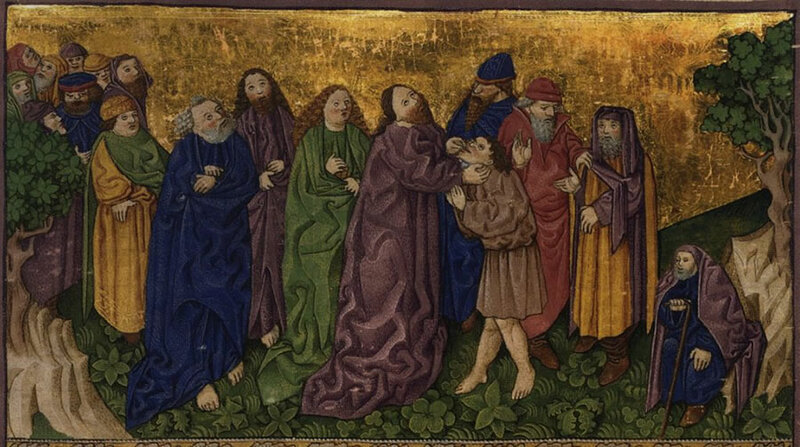 Although Jesus tried to restrain the man in today's Gospel, the cured man and all those around proclaimed what had happened to the deaf and dumb man everywhere they went. Ephphatha is an Aramaic expression. Aramaic – which was the mother-tongue of Jesus – was the language spoken in the regions surrounding Galilee and may be also in parts of Syria. In Hebrew, Syria is referred to as 'Aram'. It is interesting that the Gospel of Mark which was written is Greek, often uses Aramaic expressions. The other examples include: Talitha Kum (Mk 5:41), Abba (Mk 14:36), Hosanna (Mk 11:9); "Eloi Eloi lama sabachthani?" (Mk 15:34). It is possible that wherever Aramaic expressions appear in the Gospels there was an eyewitness account. That is, someone who remembered the story with all its details narrated it to the gospel writers. So did the deaf man himself live to tell this story in the Markan church? Or does it have some allusion to the rite of Baptism? In celebrating the sacrament baptism, we have this prayer over ears and mouth. So, let us pray today for the gift of hearing, to hear the voice of God calling to us in everything that will happen this day. Let us pray for the gift of speech, that is, to be so filled with the liberating experience of knowing Jesus that we simply cannot refrain from sharing that experience with all those around us. He is the one who can touch us and heal us and make us his true followers.